Over the past several years, there have been many attempts to rid the world of credit cards, at least in their present form. That is, one single rectangular piece of plastic that is often accompanied by many more in an overflowing wallet. To alleviate this perceived mess, a number of companies have come up with clever ways to consolidate the cards we carry. For instance, a company called Wallaby is currently developing a single credit card that will automatically use the card that rewards you best, based on the situation. So if you use the card while dining out, it will automatically use the card that offers the most discounts on restaurant purchases. This is accomplished by inputting all your credit card information into a cloud-based digital wallet. There’s a similar iPhone app by the name of Glyph that tells you which credit card to use as well. 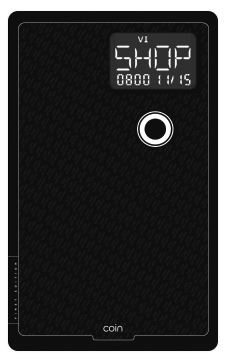 Then there’s the Dynamics ePlate credit card, which has a button on the front of the card that allows you to toggle between different rewards. A new product is in beta called “Coin,” which promises to consolidate all your credit cards, debit cards, gift cards, loyalty cards, membership cards, and so on into one credit card-looking device using some fancy technology. It shares the same dimensions of a credit card and has a similar plastic skin, but seems more akin to something out of a post-apocalyptic techie future. At the moment, it’s only available in black, or what they refer to as “midnight,” but other options might be available as time goes on. The Coin device features a small screen that displays the brand or identifier of the credit/debit card, the last 4 digits of the card number, the expiration date, and CVV/CVC number (if applicable). Essentially, you add credit card information to your Coin device by registering them to an associated mobile app. This is accomplished by taking a photograph of your card (front and back) and swiping it through a card reader that attaches to the iPhone or an Android device. Once all the information is logged in the Coin app, you can manage and sync cards to your Coin device. While you can add an unlimited number of cards to the app, only eight can be loaded to your Coin at any given time, which is somewhat restrictive for the card-heavy individual. When it comes time to pay, you use a toggle button on the Coin device until you land on the desired card, and then simply hand it to the clerk to swipe as usual. It works just like a normal credit card and won’t require anything special from the person swiping it (you can also use it in ATM machines). In fact, it’s actually more secure because it doesn’t display the entire credit card number. Additionally, it works in a limited range via Bluetooth with your associated smartphone. So if someone tries to steal it and it’s out of range, it won’t work thanks to its “auto-lock” feature. This same technology will alert you if you happen to leave the Coin behind, which is a common problem plaguing those who frequent bars these days. If Coin interests you, you can sign up for a pre-order until December 13th to get the device for half off its normal price of $100. It’s expected to begin shipping in summer of 2014. Update: It took a lot longer than anticipated, but Coin is finally shipping out to customers who pre-ordered the device many moons ago. The company noted that Coin will work at “millions of locations,” but for merchants that use payment systems that require your name (their technology doesn’t currently transmit names), Coin will not work. This is cool, but why not just use your phone to pay for things? Why do we need cards? Yeah, that’s kind of how I feel. Why are bothering with fancy new cards when we have phones that can do the same thing a lot better. Agree, seems like a step back technology-wise. We need to come up with more software, not more hardware. Next Next post: Who Is C F Frost of American Express Credit Card Fame?